People lay flowers in honor of the dead outside the gate of the dusitD2 hotel complex which was attacked last week, at a wreath-laying event organized by the hotel complex management in Nairobi, Kenya, Jan. 22, 2019. It’s the first time civilians have been allowed to access the area since the attack, which claimed the lives of 21 people. 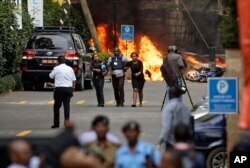 “The security situation is calm, and all the security services are alert. 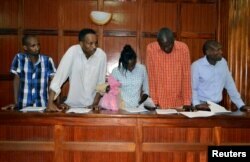 Investigations involving Dusit 2 are going on; we have made a number of arrests so far...we are satisfied that the investigations are going on well and those who were involved in this justice will be done,” he said. Security forces help civilians flee the scene as cars burn behind, at a hotel complex in Nairobi, Kenya, Jan. 15, 2019. Anneli Botha is a terrorism researcher. “Al-Shabab [is] being successful especially in areas where you have vulnerable communities, people feeling marginalized due to a number of reasons; it can be religious, it can be ethnic. Some of the areas I think they are abused before, but also frustration toward the Kenyan government has also been proving quite successful in the hands of al-Shabab," said Botha. People are evacuated by a member of security forces at the scene where explosions and gunshots were heard at the Dusit hotel compound, in Nairobi, Kenya, Jan. 15, 2019. “I think what Kenya needs to do is to re-look at its ideological pushback countering violent extremism strategies," said Mustafa Ali, a Horn of Africa security expert based in Nairobi. "While the security has done very well to address violent extremism and terrorism, the area of community mobilization awareness is something that has lagged behind, and that is something that the country needs to look at it carefully."